Delhi chief minister Arvind Kejriwal has come down heavily on the Rashtriya Swayamsevak Sangh and the Bharatiya Janata Party, alleging that they are encouraging goonda raj in the country. Refuting the allegation that his Aam Aadmi Party is the B Team of the BJP, he asked why then India’s Prime Minister Narendra Modi is scared of only Arvind Kejriwal and not Congress leaders Sonia or Rahul Gandhi. 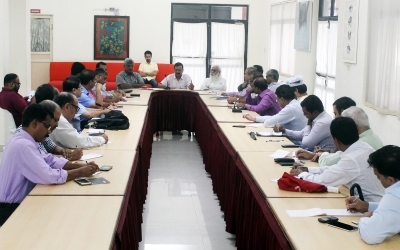 Speaking at an informal chat with the editors of print and electronic media today morning, Kejriwal asked why the Gujarat government had cancelled booking of the venue of his meeting with the Gujarat traders’ association scheduled on 10th July. “I was supposed to visit Gujarat on 10th July to attend this meeting. But the BJP government is scared even before I enter Modi’s state”, said Delhi CM. According to him, both the RSS and the BJP are presently encouraging goonda raj of communal extremists. “They beat up people for not saying Bharat Mata Ki Jai and don’t take any action against those who kill people for eating beef”, said Kejriwal, before leaving for Delhi after his three-day Goa visit. He also said the BJP has converted JNU in Delhi or Allahabad and Hyderabad universities into war zones by curbing freedom of speech and spreading communal virus. “There are groups who inflate communal riots by taking contracts of Rs 5 lakh. These riots are helping none other than the RSS and the BJP”, he alleged. Predicting that the BJP would not come to power in 2019 election, the AAP national convenor said more than half of the voters who voted for the BJP in 2014 (31%) are today feeling cheated, realising that the saffron party had projected false glorious picture of the so called Gujarat model of economy. Kejriwal said AAP will not stop any grants given presently to primary schools or any schemes floated by different governments for the people of Goa. The question was asked in the background of RSS–led Bharatiya Bhasha Suraksha Manch demanding withdrawal of salary grants to the Church-run English primary schools. On the Medium of Instruction issue, Kejriwal however said a policy decision would be taken after deliberating with the people and concerned stakeholders during Goa Dialogue. During his three-day visit, Kejriwal had almost half-an-hour meeting with Goa’s Archbishop Filipe Neri Ferrao today morning. He had also visited Swami Brahmeshanand at Kundai yesterday while visiting Iftar part organised by Muslim community of Vasco on Tuesday. Regarding Janlokpal, he said AAP would present two bills, one within the purview of the state Assembly and another one for which approval of central government is required. “We will also introduce several administrative reforms including providing government certificates online, on the lines of Delhi administration”, he said. Mr Arvind Kejriwal is doing the right thing & I wish him all the success & always.